Born to Nigerian parents in South-East London, Dumi grew up with his brothers and sisters in a ‘fun house full of music.’ Living amongst a close-knit community of family friends, it was here Tinie Tempah and Dumi were first introduced at a family party. Son of an entrepreneurial landlord father and social worker mother, Dumi grew up with their driven and caring authorities whilst also being influenced by South London street culture. It’s this hybrid of inspiration that has shaped his personality and the direction of his business into what it is today. Dumi has made his father’s ambitions an actuality – shirking any suggested class or social barriers, throwing out the rulebook and winning at his own game. 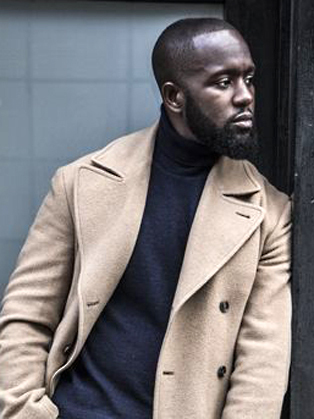 Whilst studying a degree in sports science at the University of Greenwich, Dumi tried to forge his own career as a rapper, but says he ultimately realised his voice was not good enough. Instead, he decided that he would be better suited as a music manager. Dumi’s ‘obsession with the music business’ was fuelled by his constant reading, studying and learning about the industry in order to see where the gap in the market was. It was through his determination that this gap has now been filled by Tinie at the forefront of British hip hop. The start, albeit slow, was not laborious but rather more relentless and at times cash limited. Dumi invested his student loans in getting Tinie Tempah studio time and made extra money to invest in his act by buying old cars, doing them up, and then selling them on at a profit. Today Dumi continues to manage Tinie, as well as singers such as Jessie J, as part of running a wider business called Disturbing London. But rather than a businessman seeking happiness to spread merely employee satisfaction, Dumi is different. He uses the tricks of his trade; his education, his demeanour and his growing black book to turn the dreams of creative individuals, and a whole city for that matter, into a reality. Perhaps – above being called a creator, manager and connector – Dumi can be best described as a crusader. Well known for his interest in sartorial trends and a regular in GQ’s ‘best dressed’ lists (most recently listed as #2’s Best Dressed Stylish Business Men 2015) Dumi is a regular at L:CM and a keen purveyor of the fashion industry, an arena he believes will become more boutique and shaped by ‘speed, truth, and agility’, due to the power of social media. Dumi is also a keen investor and consultant who advises and develops brands with a strong vision, currently this includes: Crowdmix, Vivid Drinks, Groovefest (a house music festival in the Dominican Republic) and a range of property investments. At the 2016 Black British Business Awards, Dumi won the Entrepreneur Rising Star Award for his work within Disturbing London to build a diverse and dynamic workforce. In 2017 Dumi was nominated at the Music Week Awards for Manager of the Year.